There are many different types of powered wheelchairs, so understanding a little about the difference of each model will ensure that when you come to buy your powerchair it will be the right one for you. To make the process of buying a powered wheelchair easier for you, here are some important factors to take into account when choosing which chair to buy. What do I need a powerchair for? Firstly, here are 5 important questions to ask yourself and keep in mind during the decision-making process. Answering them honestly will narrow down your search for the right chair. Where will I be using the powerchair? Indoors, outdoors or both. What kind of speed and range will I need from the powerchair? Do I travel regularly and if so will I be taking the powerchair in a car, on public transport, or even on planes and ships? What kind of seating style would I prefer and be most comfortable with? Am I looking for a light weight chair that can be easily folded? Will I need any bespoke modifications to suit my requirements? Powered wheelchairs are often referred to as electric wheelchairs, as well as being shortened to powerchairs. They are ideally suited for those that do not have the stamina or strength to push a manual wheelchair or don’t want to rely on someone else to push them. Indoor/portable – ideally used inside or in places with smooth even flooring such as shopping centers. They are normally easy to fold away and transport in a car. Outdoor – Outdoor power wheelchairs have larger wheels and include suspension to help tackle trickier terrains such as pavements and roads, however they tend to be a larger sized and less portable. Indoor/Outdoor – These are designed to be good all-rounders that can be used in a wide range of situations whilst still providing a good balance of features. One important thing to bear in mind is all powered wheelchairs tend to be heavier than manual wheelchairs. This is due to the stronger frame and the weight of the battery and motors. Keep this in mind if you are thinking of transporting the chair regularly. Class 2 powered wheelchairs are for use only on pavements whereas class 3 powered wheelchairs can be used on both roads and pavements. More detail on the classes of powerchairs and their speed limits can be found in the Highway codes ‘Rules for users of powered wheelchairs and mobility scooters’. 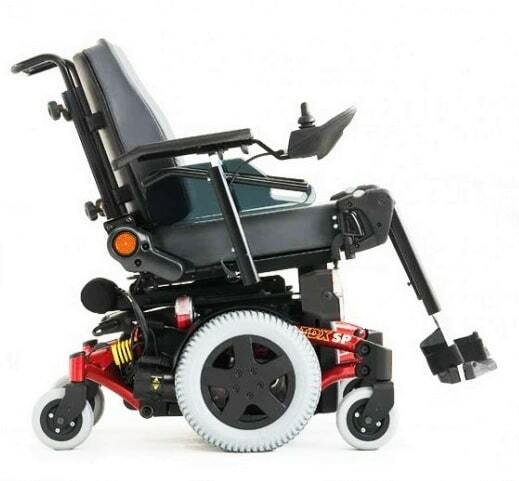 Powered wheelchairs can be split into two main components; the powerbase (containing the motors, wheels batteries and control module) and the seat. It’s important to be aware of this as there are many variations and adjustable components available. 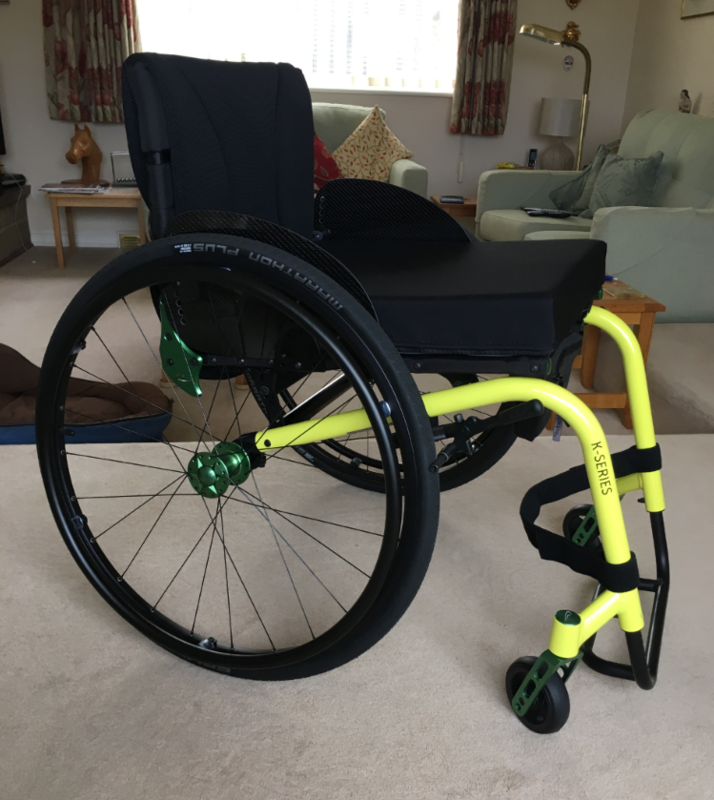 The main difference in the powerbase is the position of the wheel drive, whether the chair is rear, mid or front wheel drive can really affect how the chair moves. Click here for a more detailed expansion on the different positions of the wheel drive. Powered wheelchairs are most commonly controlled by a joystick found on the arm of the chair. These can seem simple but occasionally require some practice to get used to. Many powered wheelchairs can have their controls adjusted to suit the individual. Looking at the dimensions of the chair will give you a good idea of how large the chair actually is and how well suited to your body it will be. Whilst many of today’s electric powered wheelchairs are designed to fit through most standard doors and hallways, if you have narrower doorways than normal you should double check the dimensions of the chair to ensure it will fit. Seat width is also worth considering, particularly users with above average body size. The weight of the chair is a very important aspect to consider. Wheelchairs are designed to give freedom and mobility back to their user enabling them to be able enjoy life, so buying a chair too heavy could become difficult to handle and tiresome. Also, every chair will have limitations to the weight it can carry. 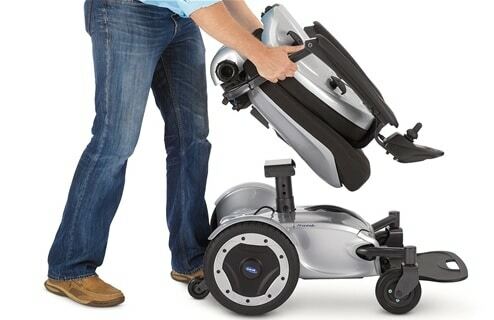 Basic powerchairs normally can carry up to 140kg, although this depends on the model. This is the amount of space available around the wheel chair in order to complete a full 360 degree turn. Aspects such as the length of the frame to the angle and type of the footrest can affect the turning radius of the chair, so it’s worth considering the turning radius of the chair before buying. If you’re planning on manoeuvring tighter paces, then it will be best to go for a front or mid-wheel drive chair as they tend to have a smaller turning radius. Front and mid-wheel drive powerchairs tend to have a turning radius of between 20 and 30 inches, whereas rear wheel drive powerchairs tend to need 40 inches or more. If you live an active lifestyle, having an easily portable powerchair is essential. Chairs that can fold or be easily disassembled mean it is easy to transportation in a vehicle. Keep in mind how much you will be travelling when choosing a powerchair. Front wheel drive – provides a small turning radius but a lower top speed compared with a rear wheel drive powerchair. Mid wheel drive – although this type of drive is not best suited for uneven surfaces it has the smallest turning radius of the three. Rear wheel drive – this is the most commonly used type of drive in powerchairs as it offers the top speed, however compared to the front and mid wheel drive models its turning capability isn’t as good. To get a true idea of each of the drive types, feel free to arrange a test drive at any one of our stores. After using the three different wheel drives you will be able to quickly identify the one that most suites you and is most comfortable to control. After choosing the wheel drive that you’re happiest with our friendly staff can advise you on the different makes and models of powerchairs with that type of drive. Tyres on powerchairs tend to be solid or pneumatic (filled with air). Check the non-driving wheels on the powerchair. In general the smaller these are the less suited your powerchair will be to bumpy terrain. Pneumatic tyres are smoother over most terrain, they’re stable as they have deep tread, although they require regular maintenance and air pressure and there is a possibility of accumulating a puncture and the tyre going flat. Solid or foam filled tyres are filled with polyurethane. The benefits of this type of tyre are that they won’t leak air or become punctured. In this respect they are much less hassle than pneumatic tyres however you may feel the bumps more as they’re not as cushioning and pneumatic tyres. This is a component often overlooked and taken for granted. Unimportant to some it is essential for numerous reasons to others. The arm rest is designed for stability and support, as well as providing comfort and rest for your arms. They also offer stability when reaching for things up high or down low, as well as stability when corning or making sudden stops. Another use is to help you push off and sit down when transferring on and off your chair, removing some of the strain from your body and offering stability to mount the chair comfortably. The armrest can be adjusted and customised to ensure when you’re sitting in your powerchair you have the maximum back and spine support to avoid any unnecessary aches and pains. So when choosing your powerchair do take into mind the different types and designs of arm rests and which would suit you most as the armrest are an important and sometimes overlooked aspect. Having good leg posture leads to good health. Legs can become swollen so you want to make sure the leg rest is, if possible, adjustable so that you’re comfortable. Leg rests usually include a padding area for the calf’s and can typically be adjusted so they are raised parallel to the chair. Powered recline systems are becoming more common in modern powerchairs, meaning the backrest can be tilted back and leg rest tilted up without any required strength and strain from the user. When choosing your powerchair bear in mind on what type of leg rest system to add, as a powered recline system will cost more initially but will be worth it if you can’t manually adjust the leg rests and would want to do so regularly. How do you control a powered wheelchair? The powerchairs controls also referred to as the joystick, will normally sit at the end of one of the arm rests. Tilting the joystick will turn and move the powerchair in any direction you want to go whilst controlling the speed and when the chair starts and stops. Modular controller – these have separate components, for a range of functions. Integral controller – less expensive than the modular, it has all the components inside the joystick housing, this usually comes as standard with the powerchair. 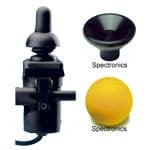 Compact chin joystick – used with the chin the nob can be replaced with a soft ball or a cup, working similar to a normal joystick the gimbal is tilted in a direction and the powerchair willmove to follow. Head control – the gimbal is attached behind the headrest, the user can simply push left or right and backwards to move the powerchair using pressure from their head. Touch control – for users who have trouble grasping the joystick a touchpad can be installed where just a light amount of pressure the sensors read the position on the pad and convert this into physical movement of the powerchair. Proximity switches – these can be mounted anywhere on the chair and don’t need pressure to activate, just the user to move near them. Usually placed under the tray of the powerchair the user can move their hand over the switches to control the chairs movement. Wafer boards – switches are visible and activated by the user’s hand, this is aimed for the user who has some control of their hand but not enough to maintain joystick control. Scanner drive control – for users with very little control, a light system will blink through each control predictably, the user then activates the control when the desired movement light is lit up. Sip ‘n’ puff – for users who aren’t able to use any part of their body, the sip ‘n’ puff can register air blown into or sucked out of a tube and the power of that air and can convert this into motion in the powerchair. However, this method does require some practice before driving. Buying a powerchair from Easy Mobility Services is not just a case of buying a wheelchair. We offer bespoke solutions for people’s individual needs and can tailor certain aspects of the powerchair to make it easy to handle and more comfortable. We provide a full ‘fitting service’ to ensure our customer’s satisfaction is guaranteed. Being able to customise your powerchair turns it from an ‘off the shelf’ chair into your own individual powerchair. Everyone is unique, so it is always worth looking at the customisable options when buying a mobility chair to make sure it is suited to your specific needs. 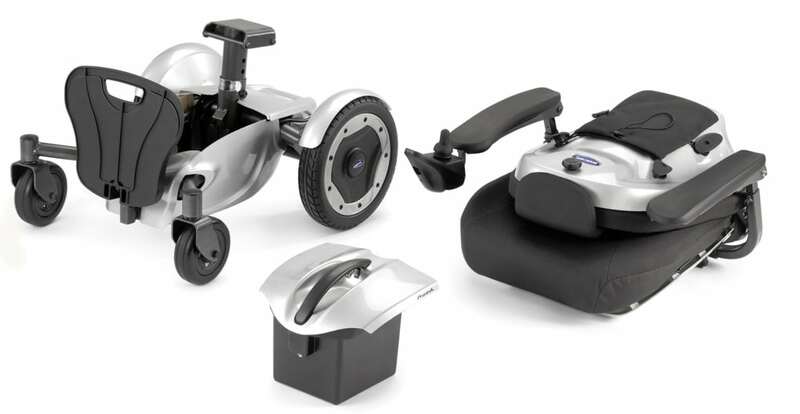 Wheelchair manufactures tend to be more flexible and create easier to adjust features compared to mobility scooter manufactures. For instance seating is normally adjustable, and comes in different sizes and materials. This is useful for those who would like a different shaped chair for more postural support or for example a firmer material used for the padding. Most wheelchairs have adjustable foot and arm rests to help you find the most comfortable position to sit in. The backrest tends to be fixed although some manufactures do offer some adjustability. The head rest can be bought as an extra for most powerchairs, offering support and safety whilst you drive. Many people opt for extra storage bags to help carry more on the go. These are really useful if you regularly go shopping and find plastic carrier bags annoying. There are even customisable options to increase protection from the elements. Waterproofs in various styles can protect you from the rain. Leg warmers, like a half-length sleeping bag that cover the lower half of the body to help deal with those colder periods. Purchasing a powered wheelchair could be one of the best decisions of your life. Being able to have that freedom to go anywhere to some is priceless. Users owning a powerchair can experience their independence and confidence, especially being able to handle trickier terrain they just wouldn’t have been able to manage before. So how do I buy a powered wheelchair? After reading about the different features and components hopefully you will now have a better understanding of what’s involved and what to consider when buying an electric powered wheelchair. The first thing you should do is visit your doctor who will be able to determine whether or not a powered wheelchair will be beneficial for you. Your doctor will be able to verify if a powerchair is required and provide confirmation for any insurance you may have to cover such costs. Review any health insurance you may have and check whether they will help pay or partially pay for the chair. It is tempting to find a powerchair online and order it there and then possibly based on other people’s reviews. We would strongly advise against this. Unless you have tried the chair first or are absolutely certain the chair is the right one for you, buying a powerchair online would be somewhat of a gamble that the chair will fit and perform the way you would expect. It is far better to physically view the chair and take it for a test drive. 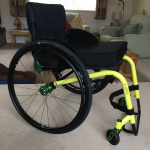 If you are looking to buy a used or second hand wheelchair from a private individual you will need to be absolutely certain that the wheelchair is fit for purpose and is not damaged in any way. It is worth noting that you probably will not receive expert advice and guidance when buying a used powerchair from a private seller, neither is it likely that the wheelchair would be covered under any manufacturer warranty. The NHS offer help in funding mobility aids and equipment. If you receive the higher Rate mobility allowance or the War Pensioners Mobility Supplement, you are entitled to take part in the Motability Scheme. The option to buy or rent a powerchair privately is of course always available. Always keep in mind when you buy a powered or manual wheelchair of any changes you will need to make in your home so it is wheelchair friendly. It’s important to properly evaluate your living areas accessibility before you buy a powerchair as the costs of home alterations and ramps may become a big factor in the decision making process. Easy Mobility Services have supplied thousands of happy customers with powered wheelchairs and mobility equipment. Please feel free to contact us or come into one of our showrooms across Essex and take a look at our range of recommended powerchairs and test drive them for yourself.